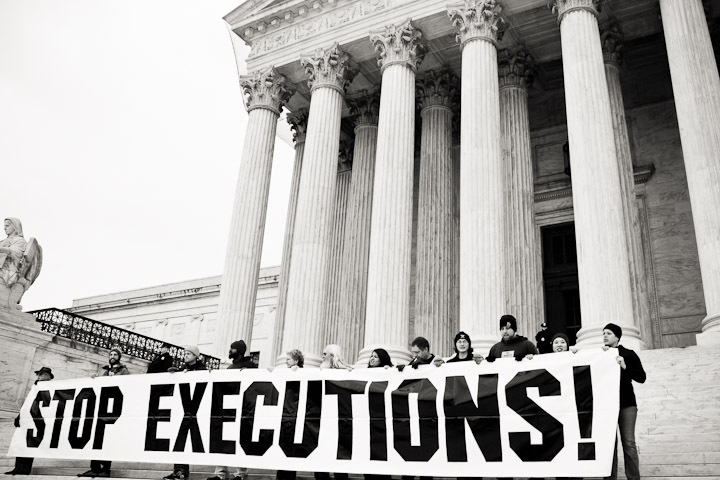 Home » Workers World Editorials » Stop racist executions! The Supreme Court has backed the use of an execution drug used in U.S. prisons over the objection of death row inmates. By a vote of 5-4, the court’s five right-wing justices on June 29 gave the stamp of approval to death-penalty states to utilize midazolam during executions. Their ruling in Glossip v. Gross endorses painful deaths and has been widely denounced by progressive forces everywhere. Four Oklahoma death row prisoners had brought the lawsuit seeking to stop the use of midazolam. One inmate has since been executed. While the drug is supposed to decrease pain during executions, the prisoners say that it does not — and cited three excruciating executions in 2014 that used the drug. Plaintiffs claimed the state’s three-drug protocol violates the Eighth Amendment’s ban on “cruel and unusual punishment.” Absurdly, the high court also ruled that the prisoners had to take responsibility to find an available alternative to this drug. Breyer cited the executions of innocent people, the 154 exonerations since 1973, and the arbitrary nature of death sentences, with “race, gender, geography and resources” as determining factors in who is sentenced to death. The preponderance of executions has occurred in 62 counties, out of 3,000 countrywide. The document admits that racial discrimination and politics are rife throughout the capital punishment justice system. Between 1976, when the Supreme Court legalized capital punishment, and this June 19, there have been 1,411 executions, says the Death Penalty Information Center. Some 1,147 have occurred in the South, most in Texas, with 526. Oklahoma is second with 112, Virginia third with 110. In recent years, the use of this cruel punishment has decreased and 19 states plus Washington, D.C., have abolished the practice. But it still goes on. Doubtlessly, the Supreme Court’s liberal grouping has been influenced by the growing, strong movement against capital punishment, active all over the country. Human rights and civil rights organizations and activists, legal associations, community and anti-racist groups, criminal justice reformers, academics and major media have called for an end to executions. They don’t want more humane methods of capital punishment: They want an end to it altogether. 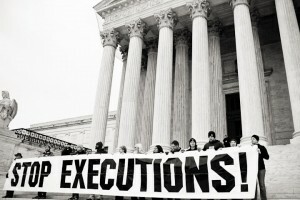 Workers World agrees that capital punishment should be abolished in every state and at the federal level. It is a form of torture that has been outlawed in more than 100 countries. The United States stands out as an advanced industrialized country that still puts people to death. What kind of government continues to kill prisoners and tortures them in the process? No millionaires are sentenced to death, though their crimes, from fouling the environment to maintaining unsafe workplaces, and mass layoffs, directly and indirectly take the lives of so many workers. In addition to its function of repressing the working class, the U.S. capitalist state is especially brutal because racism and national oppression are embedded throughout the criminal justice system, from the disproportionate rate of arrests and incarcerations of African Americans and Latinos/as to the imposition of the death penalty. While African Americans make up around 15 percent of the U.S. population, some 490 have been executed since 1976, more than a third of those put to death. This terrible reality shows the racist character of the death penalty — known as “legal lynching.” This atrocity is a holdover from centuries of national oppression, the enslavement of African people, followed by Jim Crow racism and segregation. 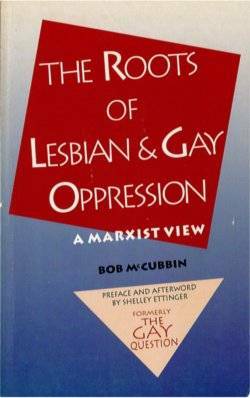 It still has a grip on many state governments. Death penalty abolitionists have a lot of work ahead, especially in the upcoming election period when reactionary politicians will use the death penalty, especially in the South, to whip up racists’ support. But, it is ever more important now to forge ahead to end this anti-human crime!